Makapu’u Point Lighthouse Trail delivers some of the most scenic views of Oahu’s wild windward coastline. 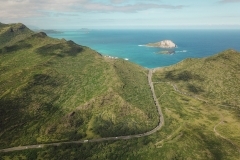 Offering up fantastic views of Koko Head Crater, Makapu‘u Lighthouse, migrating humpback whales (November – May), and on a clear day Moloka‘i and Lana‘i. Makapuu Point Lighthouse Trail is a well maintained paved trail that is a great stop on a Drive Around Oahu or as a solo sunrise hike. Hiking Makapu’u Point Lighthouse Trail is one of my favorite hikes anytime I visit Oahu. There’s something magical about hiking out to the easternmost point of Oahu (hike to Kaʻena Point on the westernmost point of Oahu) and feeling the trade winds head on. This hike can get quite busy but don’t let that stop you. It’s a great option for a sunrise or early morning hike to beat the crowds. From Honolulu, take the H1 freeway east until it becomes Kalanianaole Highway (Highway 72) drive about a mile past Sandy beach. The park and the parking lot is on the right. The trail is a 1.5 mile out and back hike that has an elevation gain of about 500ft to the lookout point and is in great shape. If you’re in decent shape and don’t stop you can easily get to the top in 35mins. You could easily push a stroller if you so wanted to but be prepared to push. Address: Kalanianaole Highway (Highway 72) 1 mile past Hawaii Kai golf course. Bring binoculars and if you want to spot whales. You can take public transit to the hike jump on bus 22 or 23 for about an hour to the Hawaii Kai golf course. Then continue up the road for 1 mile.